This Patricia Urquiola designed integrated fridge freezer has a dual cooling system that uses two fans to maintain optimal humidity and freshness, while also preventing any transferral of odours between fridge and freezer. Featuring a highly efficient A++ energy rating, this model can also help minimise energy consumption in your home. All of our current refrigeration products are manufactured with either a metal flame retardant back or an aluminium foil covered flame retardant back, providing increased protection. Our Dual Cooling technology provides two separate cooling systems to offer faster cooling, whilst also maintaining optimal humidity in your fridge and dryness in your freezer. This technology also prevents the mixing of odours between fridge and freezer. With the ability to adjust the temperature of both fridge and freezer, this useful control panel also displays the Quick Cool and Fast Freeze functions, as well as a Holiday Mode for when you’re away from home for a long period of time. 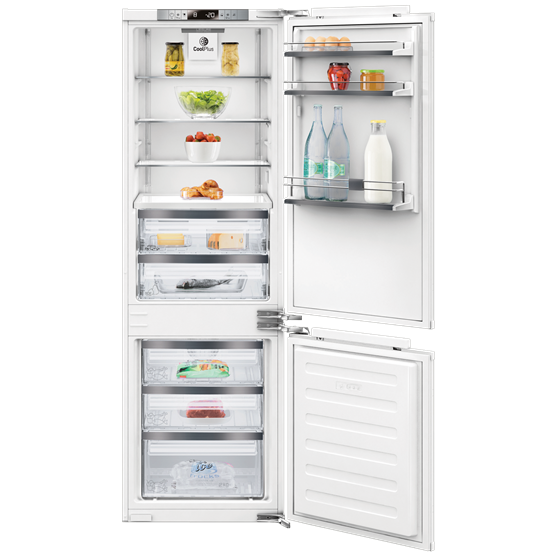 With a high A++ energy rating, this fridge freezer helps you cut down energy costs. Providing a hygienic environment for your dairy, fish and meat products, the Chiller Zone compartment maintains a low temperature of around 0ºC, helping items to retain their freshness for longer. Good Points: Great fridge plenty of space, was unsure whether I would like the lack of shelves in the door but much prefer the two drawers you get because of the space. B3st value around. Good Points: Door open alarm, LCD Display is handy for keeping track of temperature. Good size veg & dairy trays.